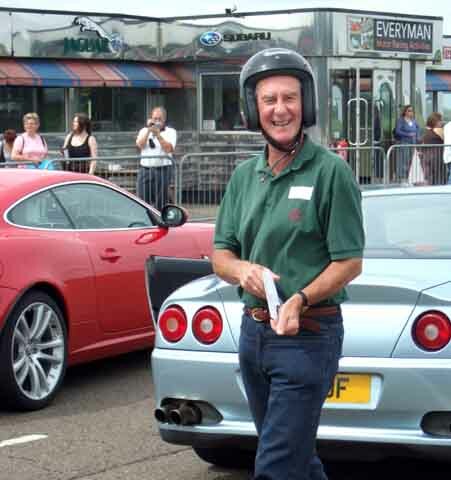 I'd long wondered about the fuss over Ferrari road cars - whether they really were as 'special' as so many made out, or whether it was all about the mystique and history especially with people who had never driven one. Personally I felt I'd prefer a Porsche, with their reputation for engineering, being a real drivers car and one you could live with every day, whereas a Ferrari is a bit 'showy' and a nightmare to live with. But lately by some accounts Ferrari seem to have lost some of the highly-strung, temperamental issues, and by contrast Porsche have become so well engineered and clinical that they have lost some of the excitement. 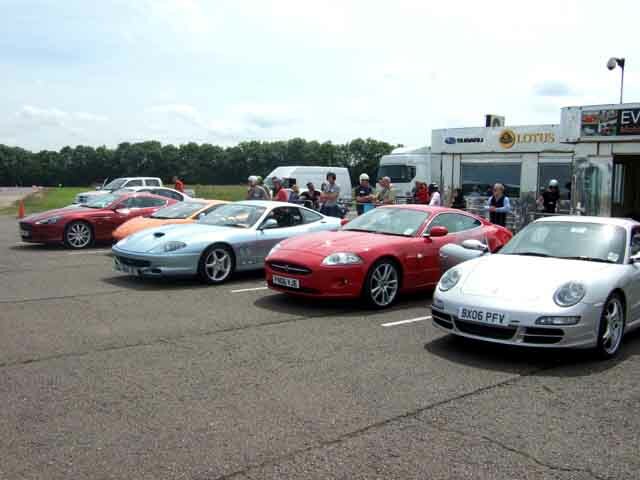 Then for a major birthday, a massive surprise, my wife, son and daughter had clubbed together to buy me an Everyman Driving Experiences trackday! 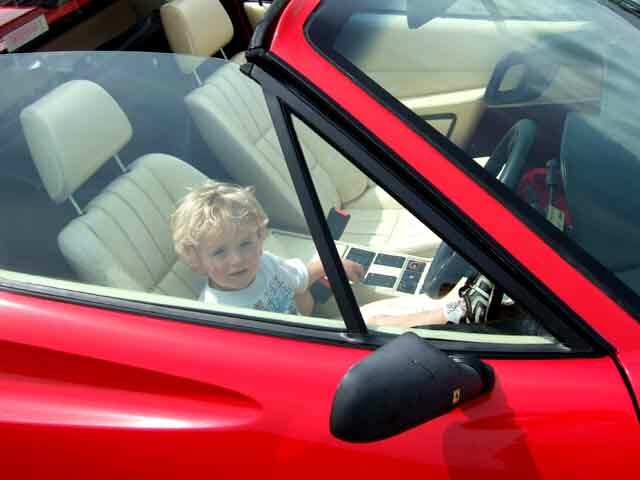 Not only that, but what had started off as an idea from my wife to be able to drive a Ferrari, by the time my son got into researching what events were available, expanded into a Euro Challenge - driving a Jaguar XK 4.2, Porsche 997, Ferrari 550, Lamborghini Gallardo, and Aston Martin DB9! Tuesday 19th June was the big day, and the weather was the biggest concern as we have had so much torrential rain leading right up to the day (and since). But the weather was perfect - warm, hazy sunshine, and just a light breeze. The location was Prestwold Hall, just north of Loughborough in Leicestershire, about an hours drive from Solihull. It was an afternoon session, which left us plenty of time in the morning to get there, rather than an early start and the risk of rush-hour delays. An old WWII airfield, part of the old runway and perimeter track is dedicated for circuit racing, and another part for Rally cars. Very professional with high quality buildings, friendly and helpful staff, quality catering, and the most important part - the cars - beautifully presented. We had a video briefing (probably about 40 of us on various Experiences) on the circuit and safety, then selected a helmet and had a few laps (BMW Alpina) as passengers to get a sight of the actual braking and turning points. The circuit is 1.8 miles long, with a half bend right-hander after the main straight coming from the paddock, a near 180 right-hander after a medium straight, short straight leading on to a half bend left-hander, longish straight, then a fast right-hander, short straight, right-angle right-hander, leading in to the paddock entrance or chicane (sharp right, left, right) and a full-throttle right-hander leading onto the main straight. The spectator area is on the outside of this last right-hander, giving plenty of opportunity for good pictures of the cars coming relatively slowly out of the chicane, but the full-throttle sound-track as they accelerate away up the main straight. Quentin Wilson was wandering around, don't know whether he was planning a program, hoping to cadge a drive, or just had nothing else to do. I wouldn't mind being a spectator myself on one of their Formula 1 days. 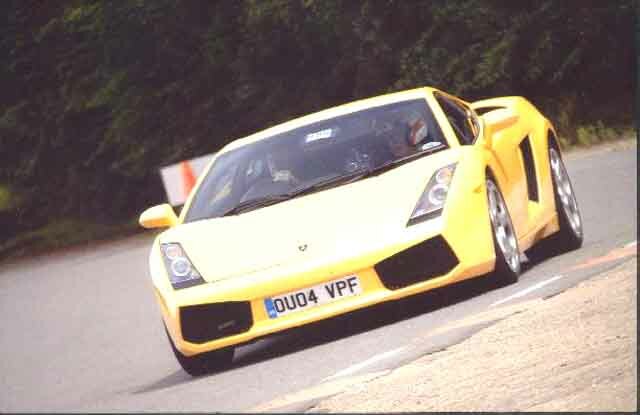 My first car up was the Lambo, which in some ways was a bit of a shame as the first few laps I would be getting my eye in, so to speak, and this was the car with the best performance (520bhp, 0-62 4s, 192mph). My first time with a paddle change which was an experience, quite odd on the Lambo as it does a 'normal' change i.e. lifts off the power, changes gear, then applies power again in quite a leisurely fashion. But a real kick in the back when applying full throttle! Surprisingly easy to drive, I was expecting more of a brute. Great exhaust note both inside the car and listening to others drive it. 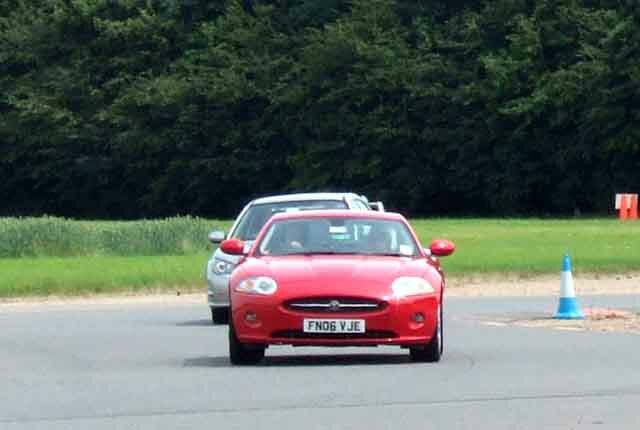 Next was the Jag XK 4.2 (300bhp, 0-60 4.9s, 155mph). The 'softest' car there, fully automatic so just point and squirt, but very creditable performance even though it wasn't much more than half the power of the Lambo. A superb car in its own right, but rather overshadowed by the others. I was a bit ragged with this one, probably trying to build up the speed a bit too soon, going into the bends a bit too quick and a bit too early. 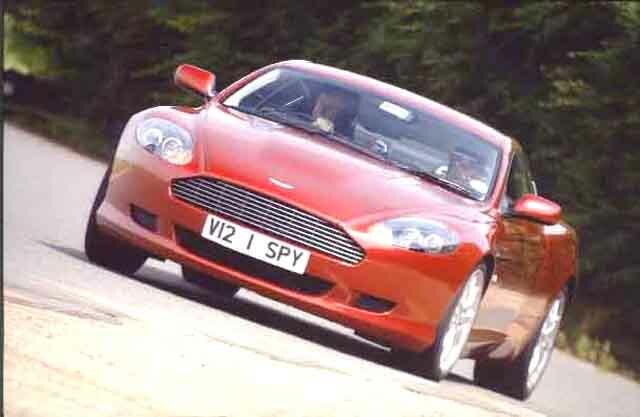 Then the Aston DB9 (450bhp, 0-62 4.9s, 186mph) and what a fabulous car, probably the finest all-round car in the world. Paddle change again but more like an auto box i.e. full-throttle changes. 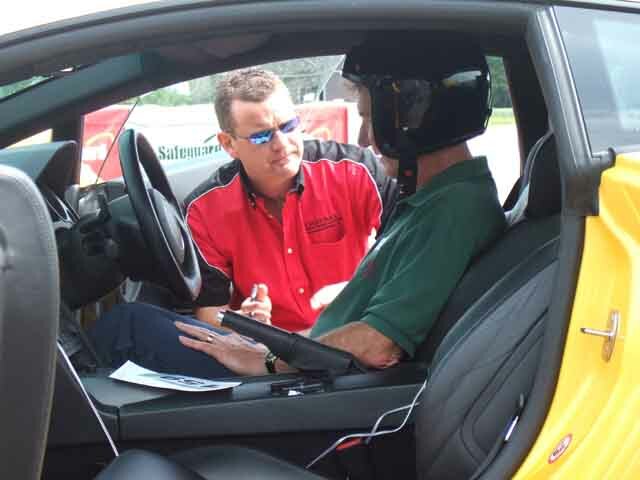 Very chatty instructor, I was concentrating on the track and not looking at the instruments and when he said I was doing 110 at the braking point on the main straight it gave me quite a start as I wasn't thinking about outright speed. On the 3rd lap he asked me what I drove, which was a bit disconcerting having to make conversation as well as drive, then it turned out he had a couple of MGBs as well. At the end of that lap instead of coming in as normal he said to go round again so we could talk MGs! 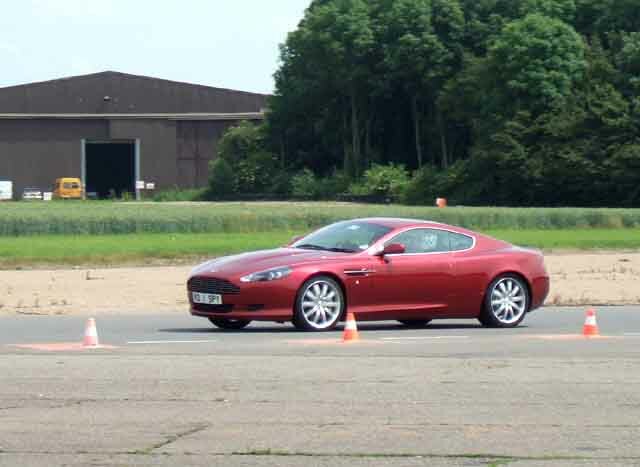 It was surreal, blasting this £110k Aston round the circuit at full throttle talking about MGBs! Fabulous drive, and a glorious exhaust listening to others. This a genuine registration, although a couple of years later the DVLA Vehicle Enquiry web page was showing the colour as silver. 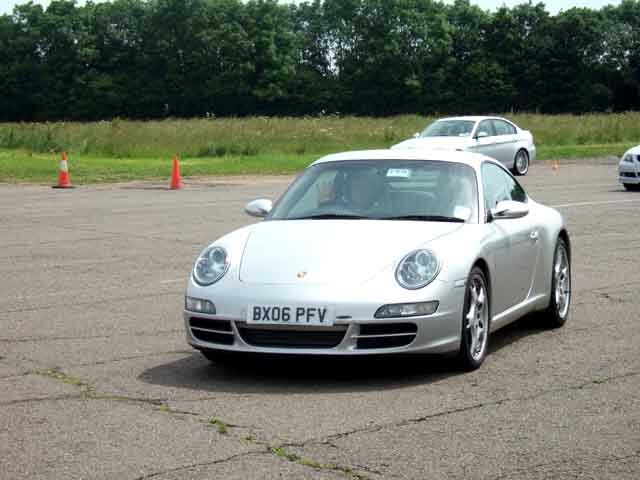 Next the Porsche (325 bhp, 0-60 4.4s, 175mph). Manual gearbox on this one, and quite easy to wrong slot as I found once changing down from 5th to 4th and getting 2nd instead. 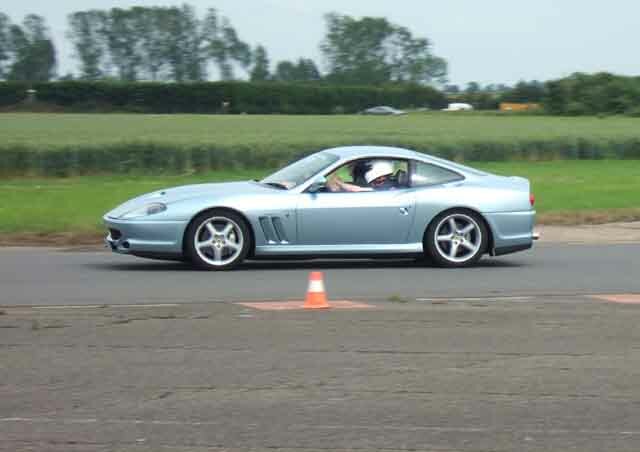 But it did feel like it had gone too far across so I only tentatively let the clutch out, realised it was in 2nd just as the instructor pointed it out and I moved it to 4th before doing anything drastic. Really enjoyed the 3rd lap in that, I could feel the back end squirming when powering out of the bends. Finally the Ferrari (480bhp, 0-60 4.7s, 199mph), and quite a surprise. 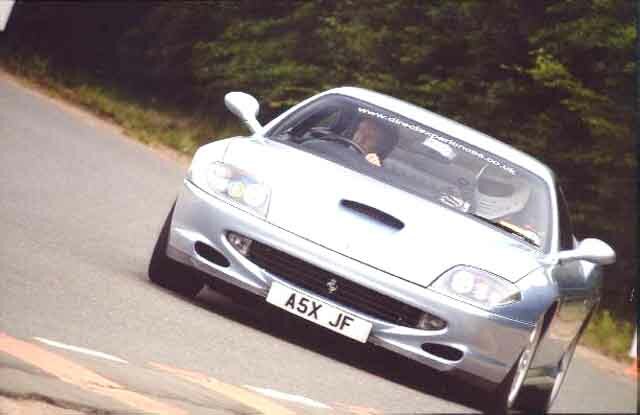 By far (not so surprisingly) the most difficult car to drive, clutch much heavier than the Porsche, gearbox needed a good push to get it into each gear, and a heavy throttle. The throttle was curious in that I kept pushing it and nothing seemed to happen, then all of a sudden there was a massive burst of power. Curiously quiet listening to others drive it, sounded more like a rush of compressed air than any engine or exhaust note, but in the car a lovely sound from the engine. This was the most exhilarating drive (and that was the surprise), when I got out I was shaking with adrenaline, which I don't recall getting with the others. Mind you, I'd done a dozen laps by that time and was really getting into it. The instructor said some of the bends were perfect and at the end said how much he had enjoyed the drive, which was nice. In summary the Jag was the least exciting, but then look what it was up against! The Lambo was easier to drive than I expected and would be surprisingly easy to live with on the road, and you could still have some fun without going too mad. I'd choose this if I needed a car for the road as well as track. The Porsche would be even easier to live with on the road, it was more involving than I was expecting, although you would definitely need a track to get the best enjoyment, it is so well engineered. The Ferrari would be difficult to drive on the road, but I got the most excitement from it, although that was probably because I drove the Lambo first and was a bit tentative with it. The Ferrari would be my choice for a primarily track car as I still prefer the additional driving experience of a manual change. The Aston was awesome, and if I could only have one of the five, would definitely be the one. 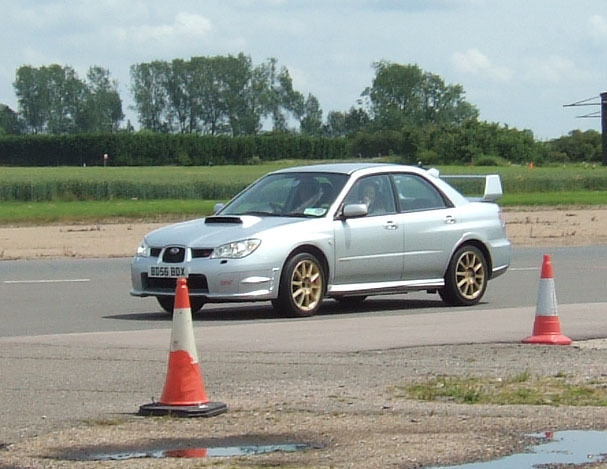 Our daughter and grandson came with us and there were passenger rides in a Subaru available, so we paid for her to have a go and she thoroughly enjoyed being scared half to death, and she got an extra lap as well. My wife declined! Byron got to sit in a Ferrari 328. Finally, the whole organisation of Everyman was top-notch, from booking, various questions before the day, and on the day. The instructors were all very friendly, with safety being very high on their agenda but the emphasis very much on enjoying the experience, I can thoroughly recommend them. When thanking one of the organisers at the end he asked if I was driving home. As it happened I wasn't as we were in my daughter's car and he said "That's good". I can only assume that they have had some people pranging their cars on the way home, forgetting to come out of 'track' mode. All in all a fabulous experience, and one to treasure for many years.